Incense | Meditation. Shaktipat. Sadguru Kedarji. 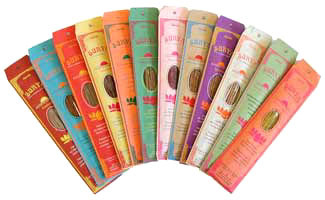 Surya Incense is a traditional offering of worship and an aid in enhancing the meditative experience. This premium brand of incense is a natural blend of Ayurvedic herbs and aromatic botanical extracts that are hand rolled in India. These natural fragrances possess the power to stimulate Shakti and healing. 10% of the revenue is donated to the displaced widows in Vrindavan, India who hand roll this incense. Incense comes in a variety of choices and scents.